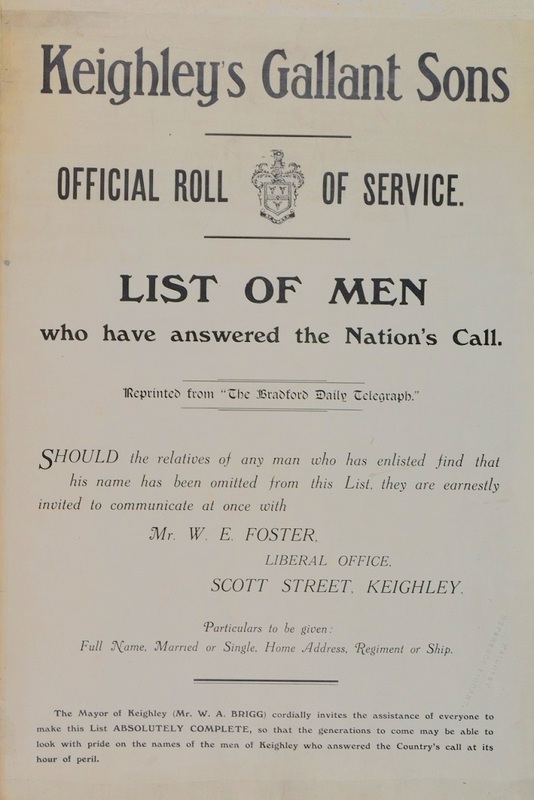 A published list in the Bradford Daily Telegraph of all the Keighley men who volunteered in the early part of the war, before the introduction of the Military Service Act. This list gives us a great snapshot of men who signed up early. 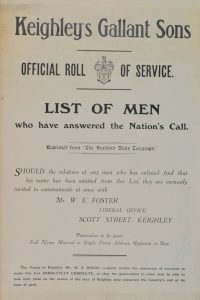 If we find no service records for a man, we can at least have a look in here to see if he joined up early in the war. It doesn't list them all of course (these sorts of things rarely do) but it's a great list and a tribute to those early volunteers. There are 1749 names, with marital status (m or s), address, regiment in it. Not all information is filled in though, and it can be a bit confusing at first. For example, some men have K.A. for 'regiment', which meant 'Kitcheners Army', so it can be more generalised than a specific regiment. The large but thin, printed and bound book is in Keighley Library on the shelves, so it's easily available, but our Project has a full alphabetically arranged transcription on computer. Contact us if you would like us to look a name up for you.